Julie Nicoll, Marilyn Henderson, Henia McLachlan. Daredevil staff at a Fife bakery are leaping to the support of one of their colleagues, and have raised thousands of pounds for NHS Fife in the process. 42 year old Julie Nicoll, from Glenrothes, was diagnosed with Myeloma around two and a half years ago and has since been receiving treatment at the Haematology Ward at the Victoria Hospital, Kirkcaldy. Myeloma is a cancer arising from plasma cells, which are a type of white blood cell that is made in the bone marrow. Julie’s colleagues at Cupar’s Fisher and Donaldson bakery are taking the plunge for their much-loved colleague by taking part in a forthcoming sponsored sky-dive at Glenrothes Airport. 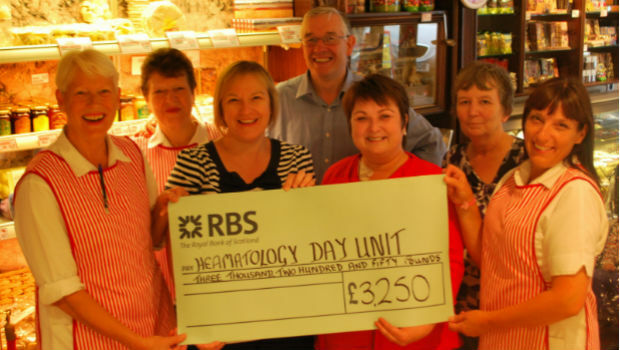 The big-hearted group has raised £3,250, with the money being donated to the Haematology Ward. “I am delighted to accept this cheque on behalf on NHS Fife and the fantastic amount that has been raised is testament to Julie and the high regard in which she is held by those who know her. “Julie has been receiving treatment on the ward for around two and a half years and has become known for bringing in cakes for everyone. Whenever I would come in and see cakes lying about I would always know that Julie had been in for treatment – as you can imagine, she is a real favourite with the staff here!